Designed to handle high volumes of disparate file-based media, Media Composer delivers accelerated high-res-to-HD workflows, real-time collaboration, and powerful media management, eliminating time-consuming tasks so you can focus on telling a great story. And now the choice is yours—edit on premises, remotely through the cloud, on demand, through a low-cost subscription, or purchase a license outright—making Media Composer the most versatile and accessible tool for professional creative editorial. 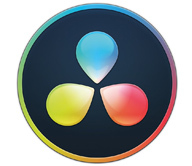 Chroma Key Pro from NewBlueFX, take charge of your color keying. There’s a reason why more professional moviemakers and television editors use Media Composer than any other video editing solution—it gives you the editing and finishing speed you need to complete projects faster. From its ACE-certified tools and unique timesaving workflows, to the most reliable media management in the biz, Media Composer empowers creative storytelling like no other. SD and HD. 2K through 8K and beyond. Even stereoscopic 3D and HDR. No matter what media you’ve got, Media Composer welcomes the widest range of file and camera formats, codecs, and resolutions, so you can acquire and turn around content faster. Without copying or transcoding media first. Whether you’ve got footage in a camera, media drive, smartphone, or video server, bringing your story together is easy. It’s no secret that high-resolution, high frame rate media can put the brakes on any workflow. Media Composer eliminates these bottlenecks, offering powerful 64-bit performance, groundbreaking Avid DNxHR and Avid Resolution Independence technologies, plus background rendering and transcoding, to keep your media and creativity flowing. Experience the fastest editorial workflows in the industry. Instantly access and edit file-based media without transcoding or copying media. Build stories with up to 24 video tracks. Preview clips before committing them to a project. Edit multicam projects with ease. Even automate non-creative media tasks—such as transcoding, consolidating, and relinking—in the background using Dynamic Media Folders. Media Composer keeps track of all projects, source material, rendered files, metadata, and other media for you, so you’ll never lose sight of your assets. Gain peace of mind with over 20 years of industry-proven media management innovation supporting everything you do. Add dramatic flair to your stories with a host of built-in effects, color, and title tools. From creating jaw-dropping VFX, green screen composites, motion effects, and transitions, to correcting color, tinting scenes, and designing graphical titles and animations, it’s easy to give your projects that professional polish. With support for a variety of High Dynamic Range (HDR) color specs, profiles, and workflows, Media Composer enables you to color grade video and achieve richer, more dramatic imagery, with exceptional detail in the shadows and highlights. It’s a fast-growing technology—and an important way to future-proof your valuable content. Sound is half the picture. With Media Composer, you can make your projects sound as good as they look. Record, edit, and mix up to 64 audio tracks in 7.1 surround. Create groups to mix dialog, Foley, music, and sound effects more easily. And polish soundtracks using the same high-quality audio effects and sound processors that come with Pro Tools. Don’t have the footage or effects you need? Shop the in-app Avid Marketplace—no shoes, shirt, or pants required. Preview stock footage in context with your project. Purchase plugins, software options, and hardware to extend your capabilities. You’ll even find training material to help advance your editing skills. Looking for the fastest way to capture, monitor, and output high-quality video? Pair Media Composer with an Avid Artist interface and get the tight integration you need to handle the most demanding workflows—from portable 4K interfaces, to solutions that offer an extensive array of I/O or video over IP. You can also use third-party interfaces through Avid Open I/O. From finding every clip or take that contains specific words of dialog in seconds, to adding advanced color correction, mastering, newsroom integration, visual effects, and titling tools, it’s easy to extend your workflow by adding one or more Media Composer options. Need to work together as a team in a post-production, news, or other media environment? 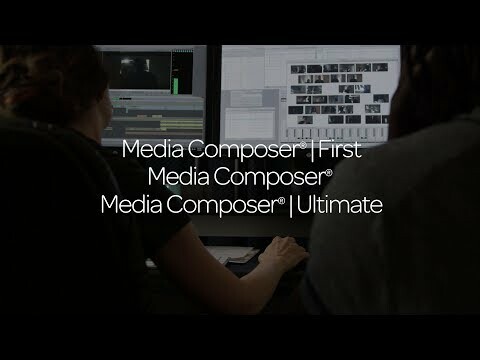 Media Composer | Ultimate (formerly Media Composer) provides all the same editing tools as Media Composer, plus extended workflows for real-time collaboration. See the details tab for a comparison chart. 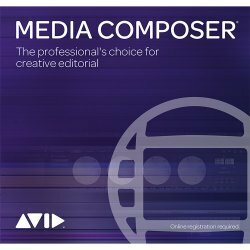 For the most up to date informatuon on Avid Media Composer licensing, please read the Media Composer Licensing FAQ. Media Composer now gives you more choices in how you acquire and use the software. Edit on premises or remotely through the cloud. Work on a Mac or PC. Access the software through a monthly or annual subscription or on demand with a floating license. Or own the software outright forever with a perpetual license. In addition, you can configure it your way with the options you need to get the job done, from real-time remote collaboration through Media Composer | Cloud (formerly Interplay Sphere), to advanced color correction and mastering tools, iNEWS and ENPS integration, and software for creating effects, titles, and more. It’s the only professional editing solution that’s available everywhere you need it, the way you want it. A Monthly or Annual "pay as you go" type of license. You are always entitled to the latest version of Media Composer for the duration of your Subscription. If your Subscription expires, you are no longer able to launch any version of Media Composer. A standard Avid Support plan is included with all Media Composer | Software subscriptions and purchases. But if your support needs are more demanding, you can buy an upgrade to Elite support, either as a monthly or annual subscription plan. A Perpetual license is one that you own outright. You are entitled to the latest version of Media Composer as long as you keep your Upgrade and Support Plan current. If your Upgrade and Support Plan expires you may still launch Media Composer, but only the last version that was released while your Upgrade and Support Plan was active. If you let your Upgrade and Support Plan expire for more than 30 days you must re-purchase Media Composer (Perpetual or Subscription) in order to receive the current version. Dongles will be supported as part of Avid’s perpetual license. In this case, the only difference is that you will need to purchase a yearly Avid Support plan, which will provide new features, patches, and enhancements as well as access to standard Avid Support. Avid offers a Floating License Server for large sites such as broadcast and educational facilities. Floating Licenses allow you to purchase a pack of licenses and ‘lease’ them out as needed. This application can be installed on any Windows server and allows customers to distribute multiple licenses (minimum of 5 as of July 8 2016) of the editing applications and software options using a single Activation ID. Licenses are checked out when a client launches Media Composer and check back in when the user closes the application. Seats can also be reserved for a specified duration allowing the user to take the client system offsite. Avid Customer Support has access to all Activation IDs and can utilize customer information, device information, or System ID (if used) in order to look up the Activation ID for a specific product. For products that utilize a System ID, the Avid software registration process requires that the customer provide their System ID in order to complete registration. If your System ID has been lost, and the product has been registered, Avid Customer support can look up your System ID (and associated Activation ID) within the registration database. Customers may return products under the following conditions; as part of our 90-day Warranty program if they do not agree with the conditions of the Avid End User Licensing Agreement (EULA), or for a purchase refund if the product is unused (subject to the specific return policies of the point of purchase). Avid will require specific product and customer information as part of the returns process. Unopened: Unopened software can be returned to the original point of purchase or the customer can contact Avid Customer Support, open the software package, provide the CS representative with the software Activation ID contained inside and then dispose of the software package. Opened: (Only applies to products using the Avid Unified Licensing system.) If the software package has been opened prior to the return request, the customer must provide Avid Customer Support with the product’s Activation ID so that they can confirm that the software is not active. If the product was previously activated the customer must de-activate (see note below) any software prior to submitting a return request. Any return requests will be denied if the CS representative cannot validate that the software is inactive at the time of the request or if the return request was not submitted within a reasonable time after product activation. For products using the Avid Unified Licensing system: The customer must provide Avid Customer Support with the product’s Activation ID so that they can confirm that the software is not active. If the product was previously activated the customer must de-activate (see note below) any software prior to submitting a return request. Any return requests will be denied if the Avid Customer Support representative cannot validate that the software is inactive at the time of the request or if the return request was not submitted within a reasonable time after product activation. For all other Avid products: It is only possible to return a download/digital product by sending a Letter of Destruction. You may also scan and email the document to shop.avid@arvatosystems.com. You will be refunded within 10 working days. Should you have any questions regarding the procedure, you may contact Avid Customer Support. In-App purchases: In-App purchases are returned using the same method as downloaded software/web purchases (see above). Please note that Studio In-App purchases, such as Concert, are non-refundable. If you are having technical issues, please refer to our online forums for assistance or contact Avid Customer Support. Rental Downloads: Please note that Activated Rental Downloads are not refundable once they have been activated. Packaged Systems (Hardware and Software): If the software portion of a packaged system has been unopened, the system can be returned to the point of sale. If the software has been opened it must first be deactivated prior to the return request (see Packaged Software > Opened above). Note: You can deactivate your software using either the Avid License Control activation application or the help menu. Deactivation requires that the product is connected to the internet. If no internet connection is available for your system, you will need to complete a Letter of Destruction form. Certain products allow you to switch from one license type to another as part of the product upgrade process. For example, Media Composer allows users to switch from a Hardware Key licensing method to a Software node-locked license as part of the upgrade process (but not the other way around). Refer to specific upgrade information within each product web page for more details. Switching license types outside of the upgrade process for products that offer various licensing schemes may only be available on an exception basis and requires the involvement of an Avid Sales representative. Transferring software rights within the legal entity that activated the software is authorized by the Avid EULA. If your license is limited to one hardware device, you may transfer your licensed copy of the software to a different device for your internal business use or your own personal enjoyment provided that you completely deactivate the software from the former device. Avid allows for the one time permanent transfer of software licenses to another end user or legal entity. Academic and evaluation licenses are prohibited from any transfer of ownership (refer to the Avid EULA for more information). For optimal performance and reliability, be sure that your computer or laptop meets the following minimum system requirements for the latest version of Media Composer. Important: Avid dedicates a significant amount of engineering resources and time to test and qualify specific platform configurations. Our Customer Success and Engineering teams are equipped with these systems in our development and support labs. For an optimal experience with Media Composer, we strongly recommend choosing an Avid-qualified system. We cannot guarantee performance, compatibility, or the resolution of issues with other systems. Windows Media export compatibility is subject to Microsoft Windows Media updates. Check vendor's website for latest 3rd party AMA plugin qualifications. Mac OS Support - Mac OS v10.14.2 has been added to the Qualified Operating Systems list. Avid Titler - The Avid Titler is a new Title Tool that works within the editing application that allows you toquickly create titles in all project types and rasters. (In previous releases, if you were working with greater than HD projects, you had to use the NewBlue Titler Pro tool.) The Avid Titler creates a Title effect in your sequence. You can create titles and then easily edit them in the Effect Editor. Just like an effect, titles can be saved back to the bin and re-used. Formatting Text - The Font formatting tools in the Avid Titler tool control the appearance of text. Using the Font formatting tools allow you to select the font, the font size, leading, kerning, rotation, skew, bold, or italics options. Creating Graphic Objects - You use the drawing tools to create graphic objects such as squares, rectangles, circles, and ovals. After creating graphic objects, you can modify or manipulate them in a variety of ways. Moving an Object or Text Forward or Backward - Once you create text and or graphics, you might want to bring one forward or send to the background. For example, you might create text and then create a solid circle or rectangle object for the background of the text. Select Previous and Select Next Layers - Once you create multiple layers of text and shapes, you can scroll through them by selecting the Select Previous Layer or Select Next Layer buttons. Choosing a Background for your Title - You can choose whether to display a color background or a frame of video from your sequence. With a sequence in the Record monitor, the Avid Titler tool opens with a video background. The location of the position indicator in the Timeline at the time you open the Avid Titler determines the initial video frame that displays. If you want to select a solid background, simply click Background button and choose a color from the Color button. Adding Shadows to Title Objects - You can add a shadow to any text or graphic object. Adding Outlines to Title Objects - You can add an edge or outline to any text or graphic object. Editing the Title in the Effect Editor - You can perform additional edits to your titles using the Effect Editor. Place the cursor over the Title effect in your sequence and select Tools > Effect Editor to edit your title effect. Shape-Based Color Correction (Symphony Option) - The editing application includes tools that allow you to perform shape-based color correction. Editing Group Clips - The editing application now supports editing group clips. If you have a MultiCam group that you want to edit or add a new shot to, you can with this release. With this release, you can also create a group clip directly from a sequence. Swap Camera Bank - With this release, using the Swap Camera Bank button will cycle through all cameras. Previously, the editing application would only show a maximum of 8 cameras (for squad split) or 18 cameras (for nine split). 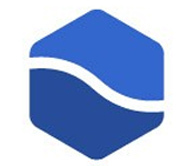 Waveform Sync - Waveform Sync allows you to sync your audio in the Timeline. Selected video must reference clips that have audio (e.g. camera sound) in order to sync your video clips. This allows you to use audio waveform rather than Timecode or an IN point to sync to the video. Changing the Source Audio Track in the Timeline - The editing application allows you to change the source track in your Timeline. Simply right-click onan audio track in your Timeline, select Change Source Track and choose the desired source track. Background Bin Auto-Save - With this release, the bin will be saved in the back ground according to the Auto-save interval set in the Bin Settings dialog. You will no longer be interrupted with a bin saving progress message. 64 Tracks of Video - In previous releases, the editing application supported 24 tracks of video. With this release, the editing application supports 64 tracks of video. DNxUncompressed Update - With the introduction of DNxUncompressed, you can import, render, transcode and mixdown at uncompressed quality. This allows you to generate media that preserves the full quality of the Timeline (currently the Timeline is 16 bits maximum). DNxUncompressed is available at any raster dimensions (HD, 2K, UHD etc.) With this release, 12 bit DNxUncompressed is supported. Timeline Settings Update - An additional option has been added to the Timeline Settings: Display During Segment Drag option. In addition to the option to show the head and tail of incoming or outgoing frames of video when you drag a segment, you can now choose to show the frame at the blue position bar when dragging a segment. Media File Path Column - An additional column has been added to the Bin Column options. When you choose to display the Media File Path column, the Media Tool will display the location of the media file for precomputes and media file objects. Adding Bins and Scripts to Project Folder - You can add a new bin or a new script to a folder in your project window. In the project window, select the folder, right click and select New Bin or New Script. If you select New Bin, a new bin will be added to the folder. If you select New Script, you are prompted to locate the script to be added to the folder. DNxUncompressed - With the introduction of DNxUncompressed, it is now possible to import, render, transcode and mix-down at the uncompressed quality. Bug Number: MCCET-2465. You might have received a “CM_INVALID_SPLIT” error when trimming promoted motion clips. Bug Number: MCDEV-9460. Windows 7 systems with Nvidia Maxwell or Nvidia Pascal cards might experience playback issues that could result in “Play Consumer timeout” errors. Workaround: Select “Disable GPU Effects” in the Render Settings dialog box. Application Installers: Previously, a separate installer was required for Media Composer | First. With this release, you have a single installer for Media Composer and Media Composer | First. Note: The option to run as Media Composer | First is now included in the Avid Media Composer Activation window. Customers NOT on a current Upgrade & Support contract must purchase either a new Media Composer Subscription or Perpetual license to receive this update. The $599 subscription includes Media Composer and the Symphony option. Designed to handle high volumes of disparate file-based media, Media Composer delivers accelerated high-res-to-HD workflows, real-time collaboration, and powerful media management, eliminating time-consuming tasks so you can focus on telling a great story. And now the choice is yours—edit on premises, remotely through the cloud, on demand, through a low-cost subscription, or purchase a license outright—making Media Composer the most versatile and accessible tool for professional creative editorial. Media Composer is now available for just $19.99 USD/month for independent editors and moviemakers. This new version provides the full suite of editing tools professional storytellers rely on daily. If you work as part of a team or within a MediaCentral environment, choose Media Composer | Ultimate (formerly Media Composer), which offers the real-time collaborative workflows you need. With support for four real-time streams of XAVC-I media, Media Composer delivers greater performance with high-res media, so you can spend less time rendering or transcoding media to lower resolutions. Steve Holyhead’s engaging presentation shed light on three everyday VFX problems, Pan & Zoom, Beauty Pass, and Transitions, which he solves using an array of filters from the BCC 8 AVX package.Highlights included: a Ken Burns style pan & zoom with no key framing needed (! ); a 1-2-3 step approach (BCC Smooth Tone, BCC Film Glow & BCC Film Grain) to giving your talent that Hollywood glow; and the power of BCC transitions - quick, easy, and versatile.Plus, get a sneak peak of the soon-to-be released BCC v8.2 AVX with up to 100% improvement in render time, the additions of lots more “green dot” effects, and enhanced real-time performance. With the release of version 8 of Media Composer, the option for ScriptSync is no longer there. Steve Audette explains a workaround using Script Interpolation which is "almost as good" as ScriptSync. Get assistance, answers, and insights and start editing now—watch Avid’s 5-part tutorial series dedicated to the success of new users. Learn how to incorporate the Media Composer “Favorites” bin into your BCC and RED workflows. This tutorial shows the workflow between Assimilate Scratch and Avid, how to export an AAF, Conform it on Scratch and re-link the new graded media on Avid. New to the 4K workflow? This tutorial from Genius DV will help you understand the basics of editing with 4K in Avid Media Composer. Scott Freeman has a tutorial up at Creative Cow named “3 Fields for Flawless Conform. Every File. Every Time.” Scott explains the three metadata fields to watch for seamless Avid-Resolve roundtripping. Evan Schiff shows you a technique he learned while working on ‘Star Trek Into Darkness’, from Will Files of Skywalker Sound, for dialogue clean up with AAX in Avid Media Composer. One piece of the metadata puzzle for both external and internal relinking with Resolve & Avid! Less of a tutorial and more tips and tricks, this blog post from Digital Rebellion tells you how to utilize the little known Avid console window to enhance performance, access hidden features and more. ncreasingly, color grading is being handled by video editors working on laptops and desktops instead of calibrated displays. Here are some ways to make this reality work for you. Check out this great Avid Media Composer tutorial that might help speed up your current workflow! Kevin P McAuliffe explains the workflow for using GoPro footage within Avid Media Composer. Topics include how to bring the video into MC using the AMA Link, resizing without loosing quality using FrameFlex, and fisheye removal using BCC Image Restoration. Click the link below to watch the tutorial. This tutorial is 2 years old, but don't worry, it is all still relevant. In this tutorial you’ll learn the fundamentals of using NewBlue Titler Pro within Avid Media Composer. Learn how the new BCC Title Studio easily delivers multi-page credit rolls in a minutes. Plus, working in any resolution and adding supers and title crawls – all without leaving your timeline. Learn about color grading and/or color correction in Avid Media Composer. Here are many resources with advice from professional colorists. You may think of Toolfarm as a place for just visual effects plug-ins and video tools, but we also know a bit about audio plug-ins. Did you know that many NLEs support audio plug-ins? This is a guide that explains the difference between Native and DSP-based plug-ins. Find out which format works with your system, whether you’re using ProTools, Cubase, Media Composer, Premiere Pro, DaVinci Resolve, Vegas or Final Cut Pro X. Here are a few audio tutorials made for the motion picture! Learn to edit dialog better, loudness levels, and audio restoration. Avid editor/trainer Kevin P. McAuliffe gives out several great tips to about tracking, exporting, and importing Mocha’s tracking data into the Lens Flare 3D MT. Kevin P. McAuliffe uses Boris Continuum’s Title Studio to quickly create a 3D animated title in this edition of Let’s Edit with Avid Media Composer,Inspired by "The Lego Batman Movie", Kevin dives into extruded text, adding lights, and the easy workflow from the standalone to the plug-in version of Title Studio, all inside Avid Media Composer. Editor Kevin P. McAuliffe shows Media Composer editors how to take day time footage and transform it into night using Continuum’s Color & Tone tools and sister product Sapphire’s Night Sky and Luna. Whether you've been editing for years or you're new to the process, everyone wants to edit faster. Although these tips are geared toward new editors, even seasoned editors will hopefully pick up a few tips to speed up their workflow. 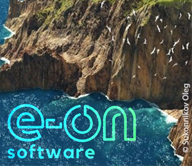 Kevin shows you how Sorenson Squeeze can interact directly with Media Composer to allow you to compress exports right from your timeline. Soundsnap has a great beginners guide to keyframing in Avid Media Composer. If you’re new to Avid, or new to keyframing, this article gives clear and detailed explanations on how to use keyframes to take your effects to the next level.